Freya Barrington took part in my Author in the Spotlight feature last month (click here to read that) and asked if I would be interested in reading one of her books. Having enjoyed stories about people who have moved abroad to live, I fancied reading about her time in Gozo so asked to read her book based on her time there. Gozo: Is The Grass Greener? is a very enjoyable read telling of the years that Freya and her husband Steve spent living on the small island which, as many of you will know, is just off Malta. We read of the instant mutual attraction when Freya met Steve as he was singing in a club, despite their both being married. Freya was in a very unhappy marriage at the time and the two eventually got together. We read about them holidaying in Gozo with a truculent teenager and deciding they want to move there. We follow their journey as they leave the UK during the snows of late 2010 and travel across Europe with a well packed car and trailer and not forgetting Ollie the lurcher. And we follow their adventures settling into life in Gozo where everything doesn’t go as smoothly as they might have expected! I really enjoyed reading about Freya and Steve’s adventures both in Gozo and actually getting there in the first place. There are many funny stories recounted some of which I’m sure were far from funny at the time! It made me smile that all of Steve’s musical equipment made it to Gozo with them while Freya’s box of performing clothes were left behind! Guess who was deciding what could be squeezed into the trailer? Freya doesn’t shy away from telling about the problems though such as the van they bought to transport their belongings which first had mechanical problems and then would only be allowed on the EuroTunnel as freight, meaning Ollie the dog couldn’t go in it. She also explains how the climate wasn’t what they expected, arriving in February when it wasn’t warm and sunny but wet and very humid causing all kinds of issues with damp in the house. Their dog Ollie was a total star and such fun to read about, even for a non-dog lover like me (sorry Freya!). He sounded totally mad but totally adorable and I loved reading about the adventures he got up to, although am very grateful that I didn’t experience the ferry with him! Although this didn’t apply to Ollie, I could sympathise with Freya’s irritation at the constant barking of dogs in Gozo. I have been to Mijas in Spain a few times and have noticed this at night-time, especially when it’s too hot to have the windows closed but with them open you can hear dogs barking all night in the valley. It would drive me mad too. One minor irritation for me was the repetition of some things, for example how Freya and Steve met was mentioned several times. It made me wonder if the book had originally been a series of blog posts or articles? This didn’t detract from my enjoyment of the book though, it was just something I noticed a few times. Overall, this was a very enjoyable read. It showed the positives and negatives of moving to another country in an honest and amusing way. Throughout the book the love Freya and Steve have for each other shines through and I’m sure without this strong relationship it could have been hard to cope with all the difficulties of the move. An easy to read and enjoyable book which is perfect for an entertaining holiday read. Perhaps one to look at if you are considering a move abroad. So is the grass greener? Well, greener in patches! If you’d like to know more about Freya have a look at her website www.freyabarrington.com, or her author page on Facebook You can follow her on Twitter @freyabarrington or have a look at her blogs, which can be accessed via her website. I follow her blog about her life in Brittany; www.breakfastinbrittany.blogspot.com which is very entertaining. Gozo: Is the Grass Greener? is the story of the bestselling author, Freya Barrington, and her husband, Steve, when they moved from the UK to live on the small, Mediterranean island of Gozo in the Maltese archipelago. 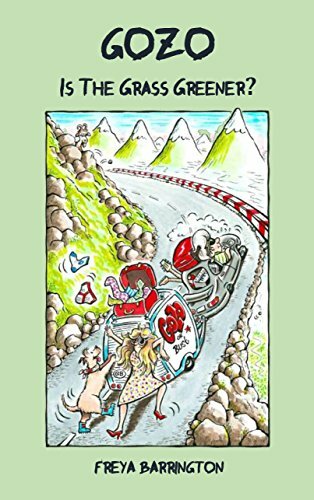 Illustrated with numerous photographs and filled with both laughing-out-loud anecdotes and sombre stories for which handkerchiefs will be needed, including an ongoing engagement with Bipolar Disorder, Freya writes about how she met Steve; their falling in love and joint singing career, the manic drive across Europe; their lurchers, Ollie and Ralph, and many other witty tales about living in Gozo for four years. Gozo: Is the Grass Greener? has widespread appeal, making the book suitable for locals and non-locals alike.